With the current economic downturn, it doesn’t mean that you and your partner should forget your dream sunset beach wedding in Boracay or postpone your honeymoon plans. Instead, consider these tips based on a recent study conducted by the Tourism Journalists Association (Association des Journalistes du Tourisme). According to the study, these are the forecasted travel destinations, type of tours, and activities that will shape the tourism industry for 2009. Due to financial constraints, more tourists will go local than abroad. And why not, when we have 7, 107 islands of the Philippines to explore. Since local travel is less expensive, you and your partner can afford to have a longer travel itinerary. There are hundreds of scenic places, add to that the number of old churches in the country where you can hold your wedding. Also, there are so many honeymoon havens here in the country. Local airline companies are now offering travel packages that fit your budget, especially when traveling in groups. No visa needed; just you and your partner and that drive for adventure and fun. If you really want to get married or travel abroad for your honeymoon, the best option is to go to our neighboring countries. Travel to nearby countries like Japan, Malaysia, Singapore, South Korea, Thailand, Indonesia, or Nepal. Foreign exchange rates in these countries are favorable to the Philippine Peso. It’s economical and at the same time, some countries, like Hongkong and Thailand do not require visa. An alternative to the usual honeymoon itinerary, why not engage in something fulfilling for the soul? Find yourself, seek inner peace, or simply go on sabbaticals or pilgrimage. Aside from the famous religious destinations like Vatican City, Israel, Palestine and Italy, other countries that have religious historical backgrounds are Greece and Turkey for the 11-day “Footsteps of the Apostle Paul” tour, Germany for the Protestant Reformation Tour, Saudi Arabia for the Hajj, Ireland for the “Footsteps of St. Patrick”, Japan for the Kii Mountain Range pilgrimage tour, and Mexico for the Virgin of Guadalupe Shrine. Local spots include Pink Sister’s Convent in Tagaytay City and Our Lady of Lourdes Grotto in Baguio City. Instead of staying in a luxury hotel, why not consider experiencing the great outdoors? There are a lot of safe camp sites in the Philippines. With tents, sleeping bags, bonfire, and the stars in the sky; you and your partner will surely love communing with nature. Game for some romantic adventure? You and your partner may want to experience mountain climbing, rappelling, white water rafting, base jumping, and other adventurous activities. These types of activities are well suited for couples who want to appreciate the beauty of nature in a unique way. The Department of Tourism (DOT), in collaboration with local tour operators and associations, has come up with cost-effective, safe adventure packages in different parts of the country. 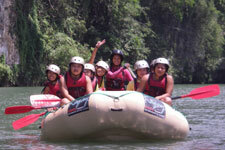 Some examples include whale shark watching in Sorsogon and white water rafting in Cagayan de Oro. Go green with your honeymoon suite. With the advent of environmental awareness worldwide, several hotels here and abroad have converted their facilities to be eco-friendly. Not only are these hotels less expensive than conventional hotels, they offer unique packages where you and your partner can experience more of what nature has to offer. 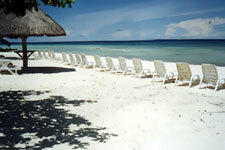 Examples include Edsa-Shangri-La Manila, Dolarog Beach Resort in El Nido, Palawan, and Oasis Park Hotel in Paco, Manila. A common practice of Filipinos during long weekends and holidays, more and tourists prefer to travel somewhere where they have relatives. This is economical and at the same time, it allows family members to rekindle and strengthen family ties. In that case, why not have your wedding or honeymoon in the province of your parents or your in-laws? It’s a good year to google your way to your destination. In an internet usage study released last year, there was a 600% growth of internet users here in the Philippines from 2000 to 2008. And with more people relying on the Internet for information, websites like www.wowphillippines.com.ph, the official website of the Department of Tourism, websites of local governments, and online travel agencies will play a key role this year in informing what each province or country has to offer. With this, tourists will plan their travel itineraries based on the information posted in travel sites. Even blogs which talk about experiences about a certain tourist spot will play a role in choosing their destinations. So get those fingers moving and start searching for a possible wedding or honeymoon destination! Whether you and your partner are on a tight budget, you should never forget to enjoy each other’s company and make sure that you get the most out of your wedding travel or honeymoon. If you think you are in for any of the travel trends for 2009, start planning your trip as early as now. Enjoy!